Chantilly, Va. — The American Council of Engineering Companies announced the winners of this year’s Engineering Excellence Awards (EEA) — the “Academy Awards of the consulting engineering industry.” AMT received a National Recognition Award for exceptional engineering design work on the Southgate Drive / US 460 Bypass Interchange project in Blacksburg near Virginia Tech. To eliminate an existing, signalized, at-grade T-intersection at the most heavily used, primary entrance to the Virginia Tech campus, the Virginia Department of Transportation selected A. Morton Thomas and Associates, Inc. (AMT) to plan and design a new Southgate Drive / US 460 Bypass interchange and associated roadway improvements. AMT first provided extensive traffic analysis and developed an Interchange Justification Report (IJR) in support of the design efforts. 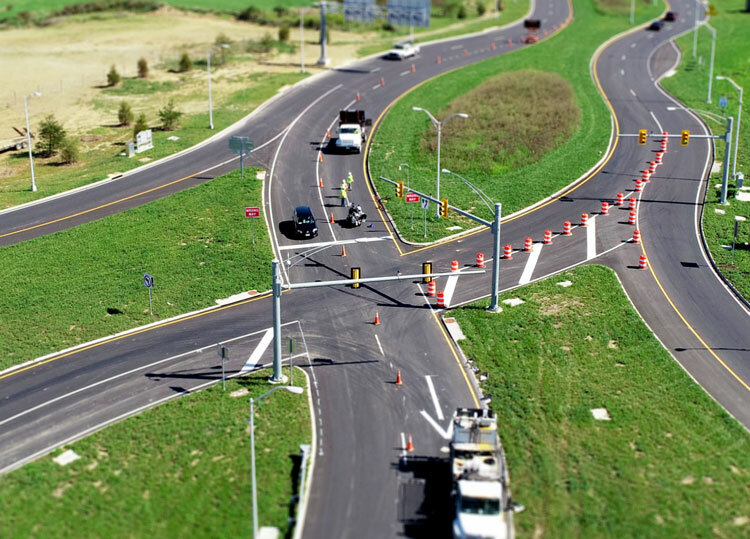 A major component of the resulting $46.7 million project is a new diverging diamond interchange (DDI) in a location southeast of the existing intersection to accommodate current and planned traffic movements. Also included are new dual bridges, featuring the Virginia Tech logo, over the Bypass and realignment of Southgate Drive from US 460 to Duck Pond Drive, introducing two new roundabout intersections along the realignment. Approximately 1 mile of the Huckleberry Trail was realigned as part of the project as well. Underpass culverts and retaining walls were designed to ensure safe and efficient passage through the area. Because Southgate Drive is the gateway into the Virginia Tech campus, aesthetics are critically important and AMT’s landscape design blends the project into the local vernacular with a palette of familiar VT plants, agricultural board fencing, special paving areas and “Hokie Stone” walls and formliner fascia. This project served as an excellent learning opportunity for some of Virginia Tech’s students, including several field trips during construction and insights on stormwater management and sustainability. A ribbon-cutting ceremony was held on December 13, 2017, celebrating the collaborative efforts between the client, designers, contractors, and numerous other stakeholders, which resulted in a new and improved interchange, safer and more convenient access to Virginia Tech, and contextually-appropriate features for roadway and trail users.